Cypress, CA — FOR-A Corporation of America, a leading manufacturer of video and audio systems for the broadcast and professional video industries, announces its plans for the 2013 CAPER show in Buenos Aires. CAPER (Cámara Argentina de Proveedores y Fabricantes de Equipos de Radiodifusíon)-an annual trade show taking place from October 23-25, 2013 at the Centro Costa Salguero-draws thousands of visitors primarily from Latin America’s professional broadcast, cable, and satellite television, cinema, and radio markets. At its CAPER 2013 exhibit in booth C-10, FOR-A will show many of its latest innovations, including video signal processors, HD/SD/analog multi-viewers, and a HD/SD frame rate converter. Video processing is a key concern in Latin America, where many broadcast standards and video formats coexist. FOR-A will feature its FA-9520, a dual-channel 3G/HD/SD-SDI and analog composite I/O device that integrates the functionality of a frame synchronizer, up/down/cross/aspect converter, full color corrector, and automatic video optimizer (AVO). The FA-9520’s toolset optionally processes analog component I/O, Dolby E encoder and Dolby E decoder signals. Also for the mixed source environment, FOR-A will show the MV-1620HS, a compact (1RU) multi-viewer that accepts up to 16 channels of HD/SD-SDI or analog composite signals, as well as NTSC, PAL, 1080/59.94i, 1080/23.98PsF and 1080/50i formats, for monitoring on one or two screens. It also features a customizable window layout, audio level displays, titles, and timers. 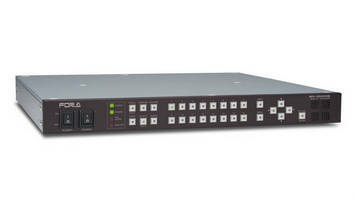 Another product on display at CAPER 2013 is the FA-1010 3G/HD/SD signal processor. With 10 video inputs and outputs, the FA-1010 offers multi-channel routing between sources as well as effective video and audio signal processing for line, relay, reporting, production, editing and delivery applications. The FRC-30 HD/SD frame rate converter and the MBP-100SX clip server will also be displayed.